New Quoll on the block! 2012 brings some new faces to Queensland Museum and Sciencentre (QM&S). At the Southbank campus, Quentin the Quoll is lending a paw to show one of the new teachers in residence a thing or two. My name is Narinda Sandry and I am one of two new seconded teachers at QM&S. Having mainly taught 3-8 year olds, I have worked in State Schools, C&K settings, at Griffith University in Early Childhood and Science courses and on projects writing science curriculum materials for the Early Years. No doubt you can guess my passions are for science and the Early Years. In my role at the museum, I will strive to unlock the wonderful resources in particular for younger learners and those entrusted to teach them. The Australian Curriculum: Science (ASC) will be the key organising framework, with special exhibitions and science events incorporated where relevant. Back to Quentin. Quentin is a Northern Tiger Quoll, an endangered species found only in some rainforests of North Queensland. Quolls are a carnivorous marsupial eating insects, small mammals, fruit and some birds. They are mostly nocturnal and are under threat because of habitat destruction, baiting by farmers, dogs, feral cats and road crossing at night. Over the year, Quentin the Quoll and his friends will be featured as animals that students and teachers can identify with to heighten community awareness of the need to protect our unique wildlife. They will appear in some blogs, be ‘snapped’ discovering new and exciting experiences at various campuses and hopefully be able to visit some schools and Early Years classes. We hope to be able to include some of your experiences with Quentin and his friends in the Queensland Museum Talks Science blog too. 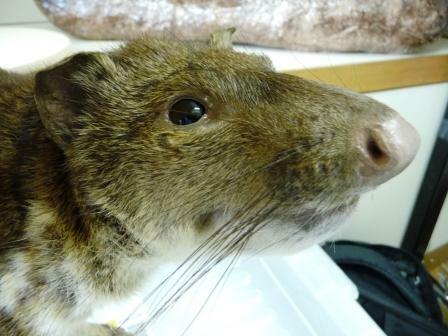 Many wonderful specimens like Quentin are available through Queensland Museum loans. Giving a character to a real specimen provides young learners with an opportunity to experience empathy and interpret the world through the eyes of an animal. Teachers can probe with questions like ‘how do you think Quentin might be feeling?’ or ‘what has Quentin learned?’ The character provides a point of reference to which learning can be attached and built up as a collective picture for example ‘remember when Quentin learned about or visited or saw? Remember what the external features of Quentin were? How can we use that knowledge now?’ Of course the character can be used across other curriculum areas too. I am very much looking forward to finding creative ways of connecting with Early Years students and teachers across Queensland. If you wish to talk with me about the museum and its efforts with regards to young learners, please do not hesitate to contact me on narinda.sandry@qm.qld.gov.au or (07) 38407668 or of course via any one of our campuses if you prefer. Happy learning!